It’s not a “radio show,” Jeff. It’s a podcast. There is a difference. [Jeff Dornik] seems to have made it his mission to single-handedly tweet-storm Phil Johnson to death. It may be that he resembles what I imagine the Lance Bass of discernment would look like. It could be the newness of him. It could be because Howse pulled Dornik out of his sleeve like a cheating gambler pulls out an Ace of Spades, right when he decided to flush two of his best podcasters down the Worldview Weekend toilet (if ever there was an appropriate metaphor, that is it) for not aggressively defending him well enough. Perhaps it’s because Dornik hit the ground running on Howse’s network with all the enthusiasm a lap dog has for its master, I don’t know. But, watching Dornik relentlessly attack Phil Johnson with a steady flock of two or three angry, heckling women has me moderately annoyed. That’s how we began the post, Jeff the Gatekeeper, On Maybe Keeping it Shut. Jeff is so not keeping it shut. Bless his heart. The first thing you need to know about Jeff Dornik is that he’s a hatchet man for Brannon Howse. Howse lost his first-string podcast hosts in the summer of 2017 because of his handling of White’s Interfaith Dialogue with Yasir Qahdi. To fill the noticeable void, he reached out to a couple guys in a desperate attempt to find a rag-tag group of yes men to follow him around like Chester does to Spike in the old Looney Toon cartoons. Jeff was – and still is – thrilled to talk into his $24.95 PC mic for the great and honorable cause of Brannon Howse. 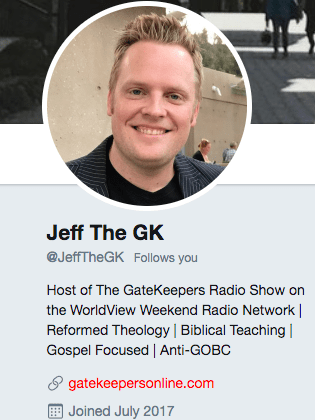 More than a month has gone by since we left Jeff the Gatekeeper (or @JefftheGK as he is known on Twitter) and he is still on Twitter pecking at people over the James White Contra Mundum of 2017 affair. Apparently, some things are hard to let go. Heck, he just posted an article about James White’s IFD twenty minutes ago over at his blog (Alexa Rank is zero in case you were wondering). The thing is, we very clearly do not agree with the concept of a game of two-hand hug played between a Pastor and Imam instead of debating or disputing. What we also don’t like is the endless molotov-throwing at anyone Brannon Howse tells you to twitter bomb. There are vultures and other carions who eat the dead. And then there are parasites that live in the stomachs of carions. Then there are viruses that live in the body of those parasites. That is Jeff Dornik, refusing to let go of the righteous white knight twitter jousting for the honor of survivor blog gals type thing he’s been doing for four or five months now. Let it go, son. Seriously. 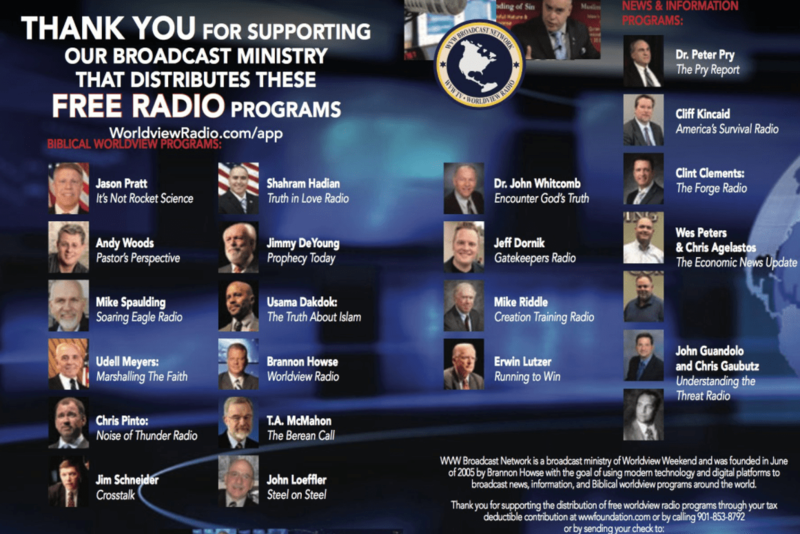 They’re not radio programs. They’re podcasts. But do you know who’s missing from this list? Justin Peters. Mike Abendroth. Susan Heck. Jesse Johnson. Jeff the GK is a lesson in doing whatever it takes to bring down a theological opponent, in this case, Phil Johnson. Playing on the cues of Brannon Howse, Jeff began to attack everyone who wouldn’t attack James White for his IFD (if this sounds like third grade, it’s understandable). However, when you begin to bend and warp the bounds of personal integrity, your righteous battle becomes unrighteous…and pathetic. This tweet from Phil Johnson demonstrates the point. The inference seems clear. Jeff is a supporter of GTY. What kind of supporter? He’s a financial supporter. After all, he’s “allowed to ask where [his] money is going.” So, Phil Johnson – being the director of Grace to You – apparently has access to such information (go figure). 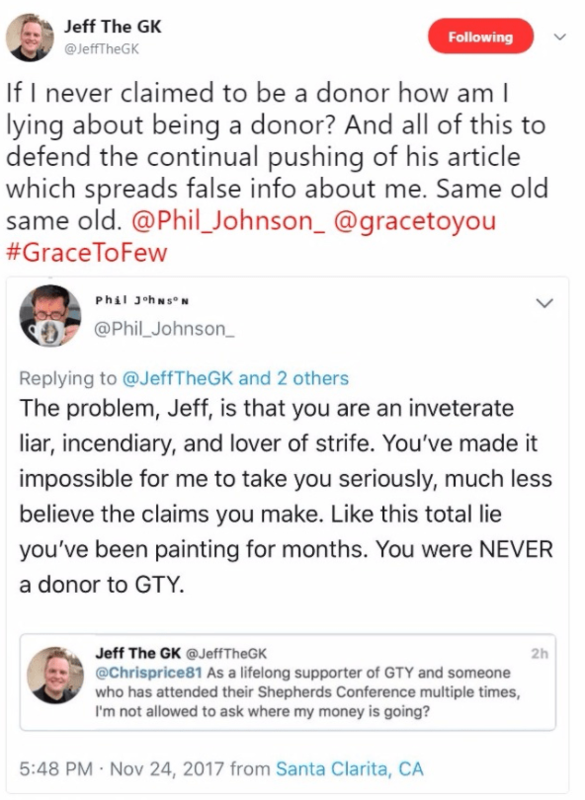 Phil then calls him out on the fib, and points out that Jeff had “NEVER” been a donor to GTY. Jeff’s response was, “If I never claimed to be a donor, how am I lying about being a donor?” The only way Jeff could not have claimed to have been a financial donor is if (A) by calling himself a “lifelong supporter” he meant to support in terms of well-wishes and positive thinking and by “I’m not allowed to ask where my money is going” he meant only his conference registration fees for ShepCon. At which point, the obvious answer would be, “Your conference registration fees for ShepCon are going to…you know, ShepCon. It would be best if Brannon Howse kindly and discreetly let Jeff the GK go. Or maybe it’s best that Jeff the GK let Brannon go. Or maybe it’s best that they both just go.